On the 17th of March, the 7th Rupert Alternative Education programme began with a day tour through Vilnius’ artist-run spaces led by Adomas Narkevičius, co-curator of the programme. The participants visited Editorial project space and spoke to its co-founder, Vitalija Jasaitė; Autarkia, the ‘artist day-care centre’ and chatted with its founder, the artist Robertas Narkus; Monto’s Tattoo, the artist-run space, where the participants spoke to co-founder Gediminas G. Akstinas; and finally, Trivium, where they had the opportunity to speak to its founder, Aistė Kisarauskaitė. 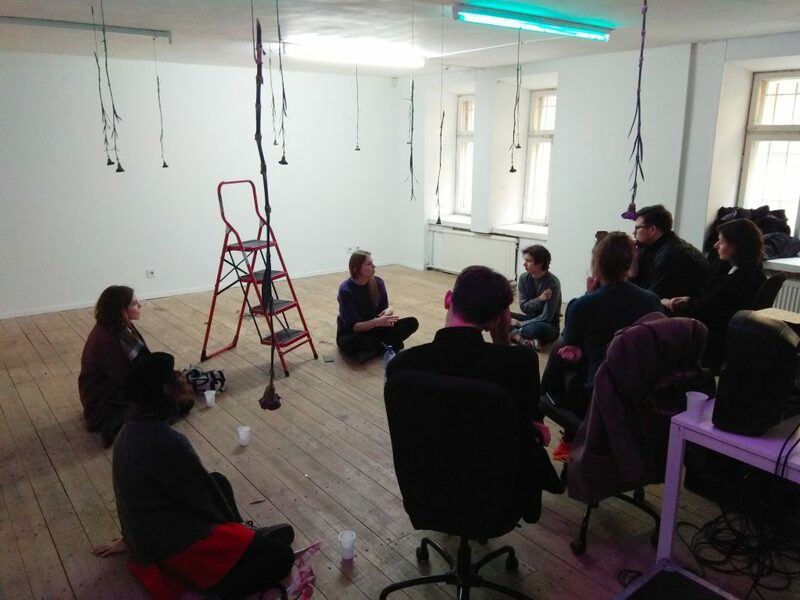 The participants also had the opportunity to have a round-table discussion with Kaspars Grosevs and Marta Trektere who are co-running 427 gallery, a non-for-profit artist-run space in Riga, Latvia. During the tour, the initiators of all these spaces shared with us their personal and professional motivations to start these initiatives and their vision behind their spaces and the possibilities they were exploring in transforming and negotiating their relationship with the local community and art world, as well as their perspectives on publicity, self-promotion and fundraising and financing. These themes opened up conversations about the role of artist-run initiatives in the current social and political climate, the dynamics between the artist and the curator, the pressures of publicity and self-promotion, as well as inquiries into the notion of community, asking ourselves whether they can be built intentionally or whether they tend to form gradually through shared threads of interests and concerns. Rupert’s Alternative Education programme is FREE for participants. Rupert is partly funded by the Lithuanian Council for Culture. Rupert’s Alternative Education programme is supported by Vilnius Municipality, guests of Rupert’s charity dinner and other sponsors.